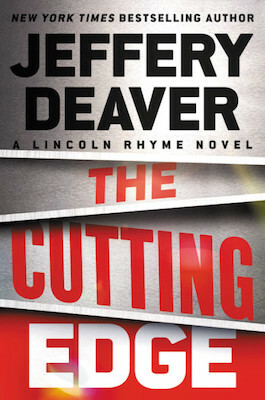 The following is an exclusive excerpt from The Cutting Edge, by Jeffrey Deaver, the internationally bestselling author of over 30 novels, including the Lincoln Rhyme series. 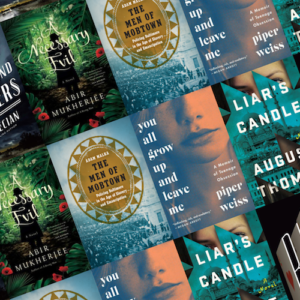 In the following passage, a yuppy couple seeking a conflict-free engagement ring instead find danger in the Diamond District. “I’m just saying. It’s kind of deserted.” The woman looked around the poorly lit, shabby lobby, the floor ancient linoleum so worn it looked sanded down. They were the only ones here, standing before the elevator. The building was smack in the middle of the Diamond District in Midtown Manhattan. Because it was Saturday, the Jewish Sabbath, many stores and companies were closed. The March wind hissed and moaned. William, her fiancé, said, “I think we’re good. Only partially haunted.” She smiled but the expression vanished fast. Deserted, yes, William thought. And gloomy. Typical of Midtown offices built in the, who knew? Thirties? Forties? But hardly unsafe. “Went to a Yankees game.” He’d once commuted through the South Bronx, and for some years, too. But didn’t mention that. From behind the thick metallic doors, gears ground and pulleys pulled. The soundtrack was creaks and squeals. It wasn’t the exertion she objected to, with that wonderful wry glance; it was, as she’d once said, that girls don’t do stairs in buildings like this.The elevator. Now, that might not be safe. But the odds of getting Anna to walk up three flights of stairs were nonexistent. His fiancée, broad-shouldered, blond and pert, was in great shape, thanks to the health club and her charming obsession with the devil-red Fitbit. It wasn’t the exertion she objected to, with that wonderful wry glance; it was, as she’d once said, that girls don’t do stairs in buildings like this. True, it was. But William had done his homework and knew he was getting quality for the sixteen thousand dollars. The rock that Mr. Patel was mounting in the white-gold setting for Anna’s pretty finger was a one-point-five-carat princess cut, F, which meant virtually colorless, very close to the ideal D. The stone was graded nearly flawless—IF, meaning there were only some minor flaws (Mr. Patel had explained they were called “inclusions”) detectible only to an expert under magnification. It wasn’t perfect and it wasn’t huge but it was a magnificent piece of carbon that, through Mr. Patel’s eye loupe, took your breath away. Most important, Anna loved it. William came very close to saying, You only get married once. But, thank you, Lord, stopped short. Because while that was true in her case, it was not in his. Anna didn’t mind his past, or didn’t offer any evidence that she minded, but it was best not to bring up the topic (hence, editing out the story about the five years of commuting to Westchester). Where the hell was that elevator? William Sloane pressed the button again, though it was already illumi- nated. And they laughed at the pointless gesture. Behind them the door to the street opened and a man walked in. At first he was just a shadow, backlit through the greasy glass of the door. William felt a moment’s unease. Is this safe . . . ? Maybe he’d been a little quick with the reassurance some minutes before. He and Anna would be walking out in ten minutes with a house down payment on her finger. He looked around and was troubled to see there were no security cameras here. But the man walked closer and offered a pleasant smile and nod, then returned to reading his texts. He had pale skin, wearing a dark jacket and knit stocking cap, carrying cloth gloves in his phone hand—all necessary accessories on this unusually frosty March day. An attaché case too. He worked in the building . . . or maybe was picking up a ring for his fiancée at Patel’s too. No threat. Still, William—a health-club and Fitbit aficionado himself—was in top form and could take down a guy of this size. A fantasy, he supposed, that every man engaged in from time to time. Finally, the elevator arrived and the doors squealed open. They got in and the man gestured to the couple to enter first. “Please.” An accented voice. William couldn’t place the nationality. “Thank you,” Anna said. At the third floor, the door opened and the man again gestured with his palm. William nodded in response and he and Anna continued toward Patel Designs, at the end of the long, dim hallway. Jatin Patel was an interesting man, an immigrant from Surat, western India, the diamond-polishing center of that country—and of the world, now. When the couple had been here some weeks ago, placing their order, Patel had chatted away, explaining that the vast bulk of gem-quality diamond polishing was done there, in boiler rooms—tiny factories like apartment buildings, hot and filthy, with terrible ventilation. Only the best diamonds were cut in New York or Antwerp or Israel anymore. Be- cause of his skill, he’d risen above the pack of cutters—thousands of them in Surat—and managed to save enough money to come to the United States and open a shop. He sold jewelry and diamonds retail—to the soon-to-be-Sloanes, for instance—but he was best known for his cutting of high-end diamonds from raw stones. He was aware that the man who’d accompanied them in the elevator had stopped at a door just before Patel’s and was hitting the intercom. There was a click of the door and they stepped in. It was at that moment that a thought struck William Sloane. As in many old-time buildings, the doors to all of the businesses on this floor had transoms above them—horizontal glass panels. Here they were cov- ered with thick bars, for security. The one above Patel’s door glowed, revealing lights inside. But the transom next door—the one the man from the elevator had stopped at—was dark. That business was closed. No! A sudden rush of footsteps behind them and, gasping, William turned to see the man, now with his head covered by a ski mask, charge toward them. He shoved them into the small room, where Patel sat behind a counter. The intruder moved so fast that Anna was knocked off her feet and fell hard, screaming. William turned but froze as the man pointed a gun his way—a black pistol. There was a horrific sound. William heard the snap of bone under the impact.Despite his age, and paunchy midsection, Jatin Patel rose fast, going for what must have been a panic button. He didn’t get close. The man lunged forward and, reaching over the counter, slammed the pistol into his face. There was a horrific sound. William heard the snap of bone under the impact. The diamond dealer screamed. Patel, whose complexion was grayish all the time, grew grayer yet. “Leave him alone,” Anna cried. “Quiet!” The man was looking around the room. A fast glance to the ceiling. There was a video camera pointing down toward them. Then he was studying the counter, the desk behind it and several dim rooms in the back. With one hand toward the gunman, palm out, to reassure that he was no threat, William stepped closer to Anna. His arm went around his fi- ancée’s waist and he helped her up. He could feel her trembling. The robber ripped a light cord from the wall. He extracted a box cutter—a utility knife—from his pocket and pressed the razor blade out with his thumb. Setting down the gun, he cut the wire into two lengthy pieces. He handed one to Anna. “Tie his hands.” Nodding at William. That accent again. European? Scandinavian? William eased to the floor. Of course, he’d get the main threat out of the way—him. Then, glancing at Patel, the burglar bound Anna’s wrists and shoved her to the floor beside William, back to back. A chilling thought, cold as a winter stream, cut through him. William realized that the intruder had put the mask on before going into the store, to hide his face from the cameras. But he hadn’t worn it before. Because he needed some customers to get him through the door of Patel’s. He’d probably been waiting for a cou- ple to follow to a company that seemed like a good target for a robbery. The security camera in Patel’s would have no recording of his features. But William and Anna could describe him. And that meant only one thing: The robber had tied them up so they wouldn’t fight back when he killed them. William prayed, If it has to happen, let him shoot us. It’ll be fast, pain- less. He managed a look, twisting his head hard upward. And saw that the man had left the gun on the counter. The gunman crouched over them, gripping the knife. William’s back was still facing Anna’s and, sobbing, he stretched his hand out as far as he could. It found hers. He wondered if it was her left one and if the finger he was caressing now was the one that had come so close to being graced by the princess-cut, one-point-five-carat diamond, only slightly flawed and nearly colorless. Excerpted from The Cutting Edge by Jeffery Deaver. Copyright © 2018 by Gunner Publications, LLC. Reprinted with permission from Grand Central Publishing. All rights reserved.